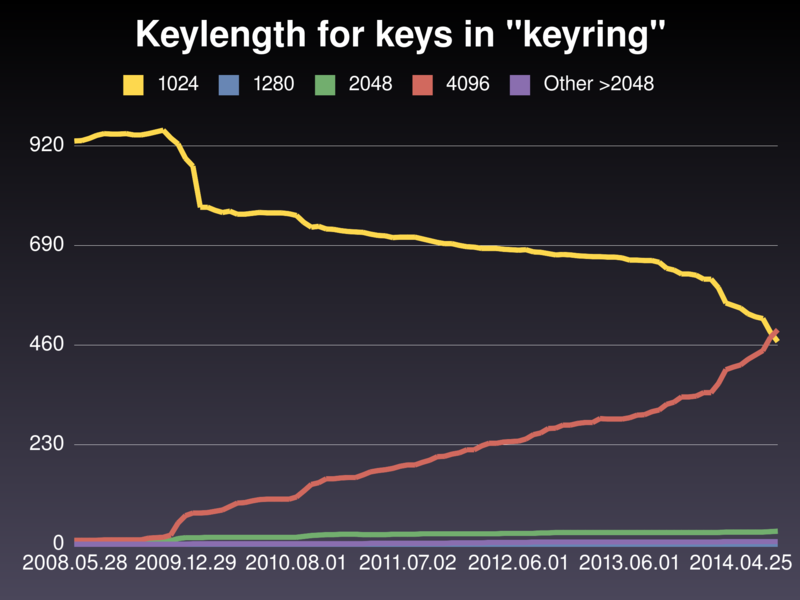 One month later: How is the set of Debian keyrings faring? OK, it's almost one month since we (the keyring-maintainers) gave our talk at DebConf14; how are we faring regarding key transitions since then? You can compare the numbers (the graphs, really) to those in our DC14 presentation. First of all, the Non-uploading keyring is all fine: As it was quite recently created, and as it is much smaller than our other keyrings, it has no weak (1024 bit) keys. It briefly had one in 2010-2011, but it's long been replaced. 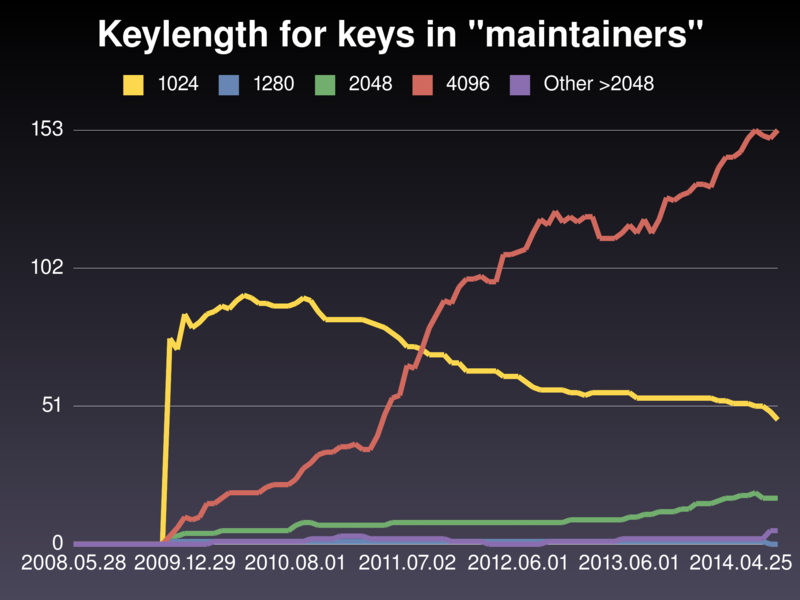 Second, the Maintainers keyring: In late July we had 222 maintainers (170 with >=2048 bit keys, 52 with weak keys). By the end of August we had 221: 172 and 49 respectively, and by September 18 we had 221: 175 and 46. 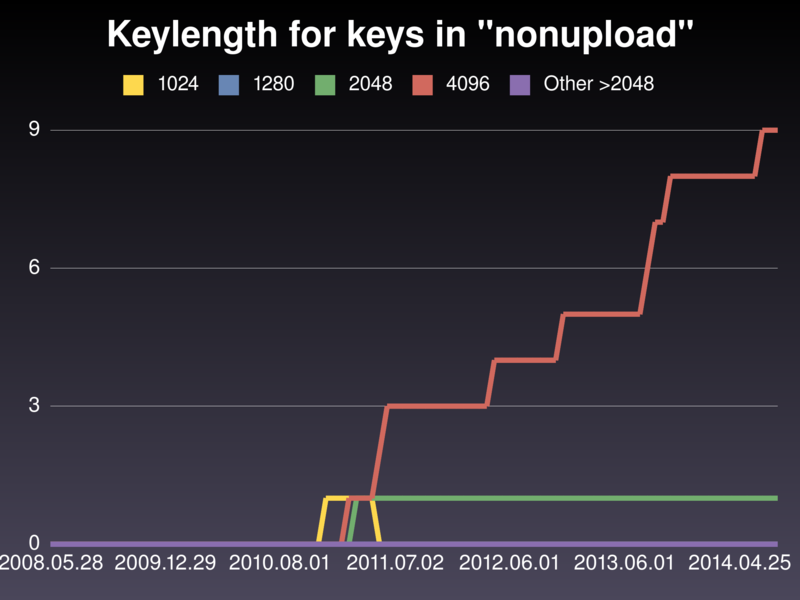 As for the Uploading developers, in late July we had 1002 uploading developers (481 with >=2048 bit keys, 521 with weak keys). By the end of August we had 1002: 512 and 490 respectively, and by September 18 we had 999: 531 and 468. Please note that these numbers do not say directly that six DMs or that 50 uploading DDs moved to stronger keys, as you'd have to factor in new people being added, keys migrating between different keyrings (mostly DM⇒DD), and people retiring from the project; you can get the detailed information looking at the public copy of our Git repository, particularly of its changelog. And where does that put us? Of course, I'm very happy to see that the lines in our largest keyring have already crossed. We now have more people with >=2048 bit keys. And there was a lot of work to do this processing done! But that still means... That in order not to lock a large proportion of Debian Developers and Maintainers out of the project, we have a real lot of work to do. We would like to keep the replacement slope high (because, remember, in January 1st we will remove all small keys from the keyring). And yes, we are willing to do the work. But we need you to push us for it: We need you to get a new key created, to gather enough (two!) DD signatures in it, and to request a key replacement via RT. 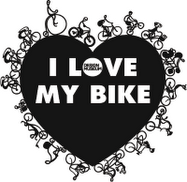 So, by all means: Do keep us busy!